Brisbane's most iconic emblem is probably the Story Bridge. It was built to supplement the existing Victoria and Grey St (now William Jolly) Bridges, both already struggling with increasing traffic flow. Its position, connecting Kangaroo Point with Fortitude Valley, also allows vehicles to travel from one side of Brisbane to the other without having to pass through the CBD. 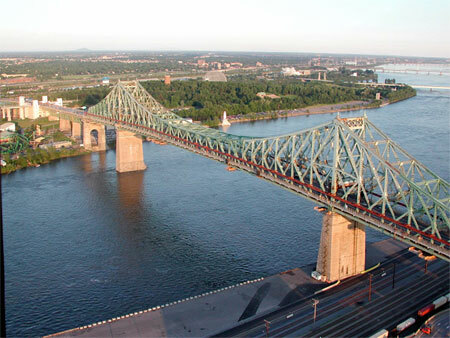 John Bradfield, designer of the Sydney Harbour Bridge, was engaged to design the new bridge, and apparently he leaned heavily on the design of the very similar Jacques Cartier Bridge in Montreal. Construction of the bridge commenced in July 1935 and the bridge was opened in July 1940. The following composite photo, taken during construction, shows the Kangaroo Point side of the bridge on the left and the Fortitude Valley side on the right. Here are some facts about the Story Bridge that you may not know. It was named after Queensland public servant John Douglas Story; the road across the bridge is the Bradfield Highway, and it is the shortest highway in the country; the length of the bridge is 777 metres; it was originally a toll bridge; there is now a tour group that offers Story Bridge climbs. The bridge is repainted every seven years, using 17500 litres of paint, and there are 105,000 square metres of painted surface. There are 1.5 million rivets in the bridge - some of them are visible in this photo of men working on the guide rails for the bridge walks - click for a bigger image. Of course, despite its six traffic lanes, the Story Bridge itself was gradually overcome with traffic, requiring the building of the Captain Cook Bridge to form another entry point to the city. The Story Bridge is still a vital conduit for Brisbane traffic, but more importantly it is an identifiable symbol of the city. That is an amazing photograph of yours. Thank you.